The Whisper Quiet fan for the PT2 cooling tower provides 12-15 dBA sound reduction, has CTI certified thermal capacity, and is ASHRAE 90.1 compliant. 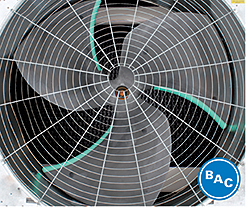 The fan is a chemical-resistant, durable, high-solidity, single-piece, molded unit made of fiberglass reinforced polyester. It is fully factory installed and aligned requiring no field installation, and it provides a low sound solution.